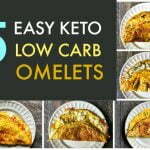 5 Easy Keto Low Carb Omelets - easy low carb breakfast options! 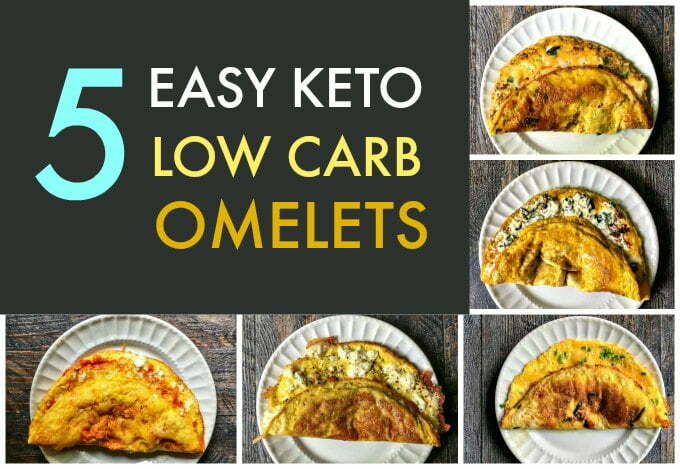 5 Easy Keto Low Carb Omelets – easy low carb breakfast options! These 5 easy keto low carb omelets make for a delicious breakfast every day of the week. Just a few ingredients to make these tasty omelets which are all under 5g net carbs! You might also like this low carb breakfast pizza! I recently went on a egg fast. I won’t go into all the gory details but needless to say I needed to come up with some keto or low carb recipes with minimal ingredients and of course eggs. Since I love eggs this was not much of a problem but I only lasted 1 full day on the egg fast. However I did come up with a few great omelets. 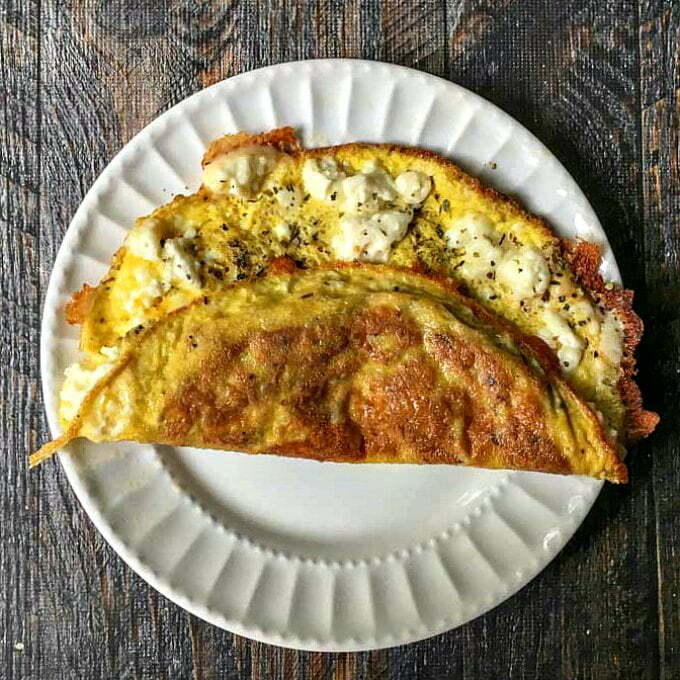 So today I wanted to share with you my 5 easy keto low carb omelets that I have been eating lately. They were delicious and all were less than 5g net carbs. A quick note: I consider these omelets keto too because they follow the basic macros of keto eating for me. They are roughly 70-75% fat, 5% carbs and 20-25% protein. 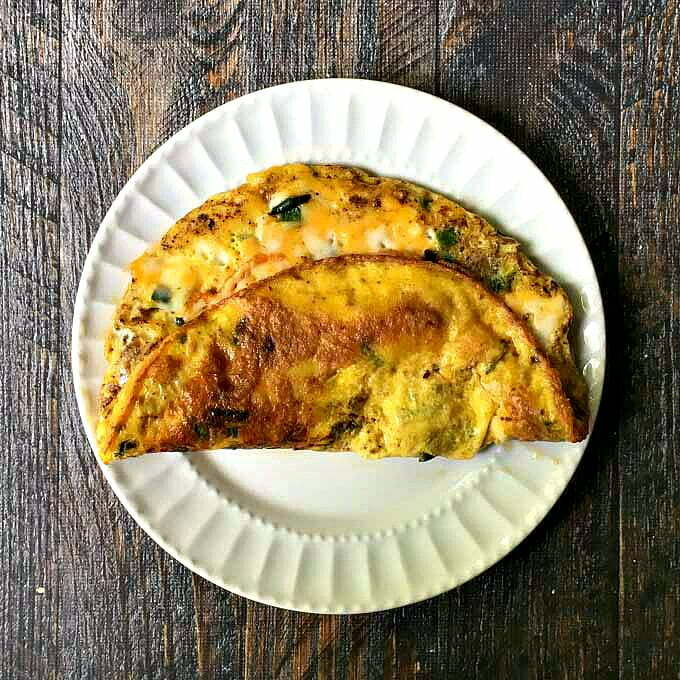 Here is the gist of how to make these yummy low carb omelets. Add a teaspoon of butter to an omelet pan and wait until it starts to melt and sizzle. Meanwhile whisk 3 eggs and whatever herbs or spices you are using and pour into the sizzling pan. Next cover the pan with a lid and turn the heat down to medium low. After a few minutes take off the lid and add the cheese and cover again. When a few minutes have passed, take off the lid and make sure the omelet is cooked through. Slide off the pan and fold it onto a plate. Easy peasy. I got this technique from a fiction book I read years ago and have used it ever since. Now on to our omelets. With the egg fast you eat just eggs, fats and cheese and that’s not hard to do with an omelet. So when thinking of cheeses to use I came up with this buffalo flavored omelet because I had a lot of leftover blue cheese. I added 1 teaspoon of hot sauce to the butter in the pan and when the omelet started setting up, I added the blue cheese and 2 more teaspoons of hot sauce. This is my favorite omelet because I have a thing about buffalo flavoring. Moving on down the cheese spectrum I also had some feta cheese on hand. So I added a bit of lemon zest and oregano to the beaten eggs and sprinkled feta cheese in after it set up. This too was very delicious! I got the idea for this one because my husband has a million Anaheim chiles in the garden. So I just added the spices and green chiles (you can use canned) to the eggs and the cheese once it set. Delicious! Cheddar and chives doesn’t just work great with potatoes, it’s great with eggs too. Add the chives to the beaten eggs and the cheese once the omelet starts to set. Simple but tasty. This omelet had a few more carbs but it was worth it! I love basil and sun dried tomatoes together and they didn’t disappoint in this omelet! See recipe below for the instructions. 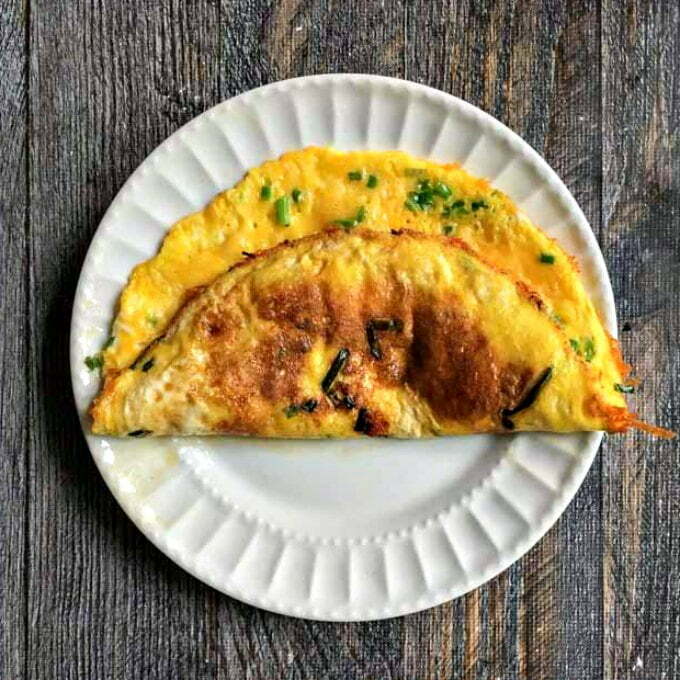 I hope you liked these 5 keto low carb omelets. They really are tasty, filling and can be eaten for breakfast, lunch or dinner. Enjoy! Meanwhile whisk 3 eggs, basil and sun dried tomatoes and pour into the sizzling pan. Mix the ricotta and mozzarella cheese together. After a few minutes take off the lid and add the cheeses and cover again. Hope you like it Michelle! I have to admit there are quite a few people at work doing the ketosis diet. They have lost tremendous amounts of weight. I will have to share this post with them. 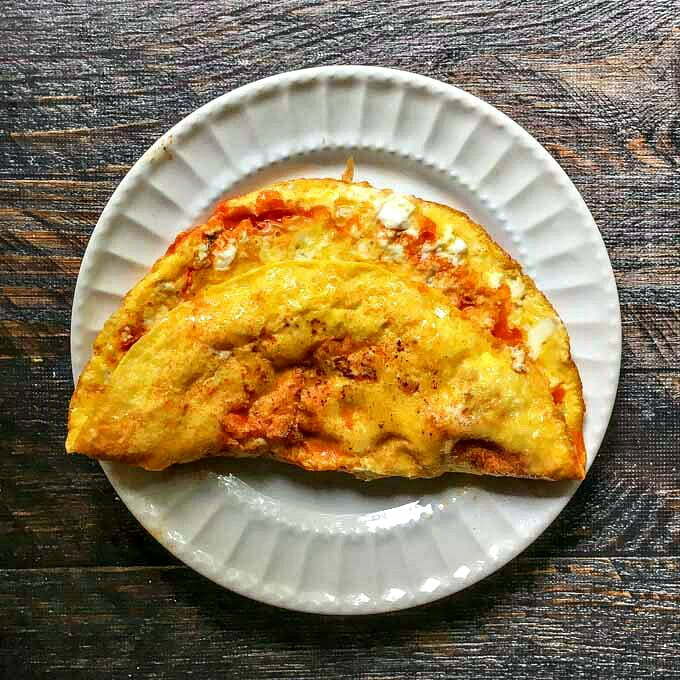 I love omelettes and eggs I general, add in that cheesy cheese and yum a perfect keto meal. Thanks for sharing your egg fast. My egg fast was a bust but a did get a lot of omelet recipes from it! Omelets are such a fun, versatile dish! Love all of your stunning variations. We’re definitely going to have to give some of these a try. I hope you like them Claire. They are very simple but tasty! The ricotta omelet is brilliant! I so often have just a little ricotta left over from a dinner and never know what to do with it. I know what you mean. That’s an excellent idea! I eat eggs rgularly for breakfast. I won’t get bored now eating the same eggs everyday. It’s nice to have some variations. I really loved how the buffalo blue cheese omelette tasted. so full of flavor with unusual for omelettes ingredients. HI Ruchi, So glad you liked it! IT’s one of my favorites too! I follow a low carb diet, with modifications. I cannot live without carbs, lol! 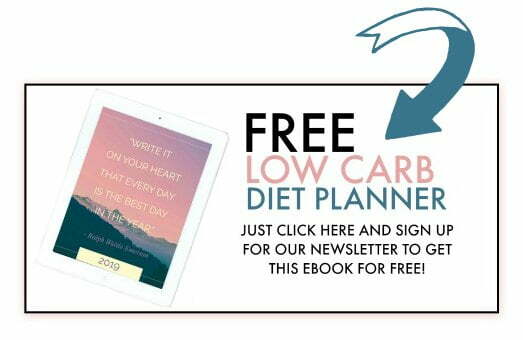 I do need and eat eggs regularly and these are fantastic recipes that are low-carb and so delicious! Eggs are a great way to full up, eat well and keep those carbs to a minimum! Hi Eileen, I am the same way. Eggs are so versatile, I have lots of low carb egg recipes on the site. I learned how to make eggs this way from a fiction book I read one time and I’ve made them this way ever since! I have never heard of an egg fast but I love these omelet ideas! Especially the buffalo one. The buffalo one is very good! 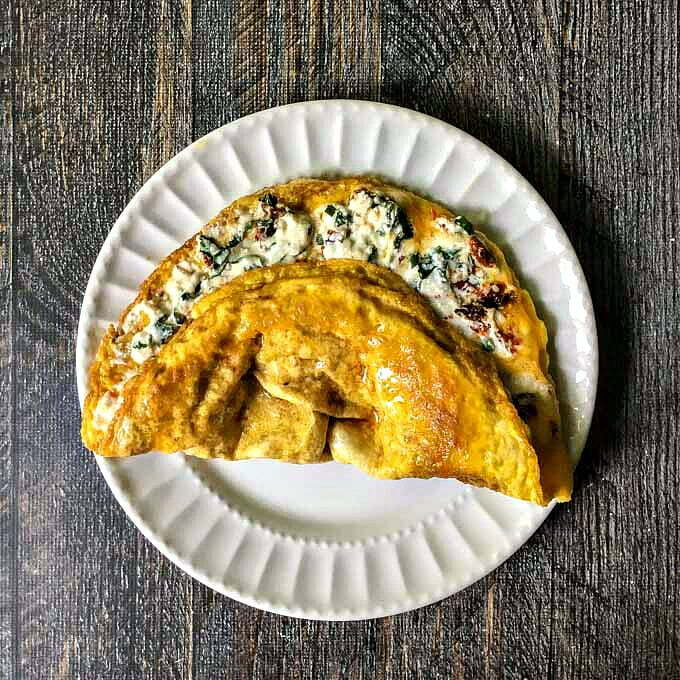 You have my favorite omelets in this collection – Oh how I love Ricotta. And that Mexican chili is to die for. Cheddar and Feta… Now I must make these again soon. Low how easy these make eating at home. Simple yet delicious. Best of all Low-Carb. I’ve been eating these a lot lately. Low carb or no low carb they still make a tasty breakfast.